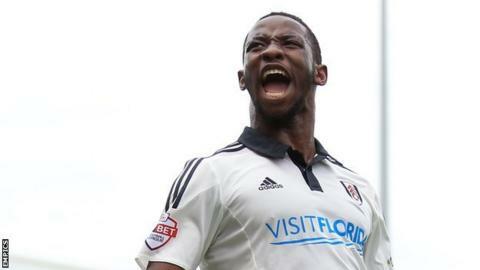 Fulham manager Kit Symons says he remains "very hopeful" of young striker Moussa Dembele signing a new deal. The 19-year-old Frenchman scored twice as the Cottagers thrashed Bristol City 4-1 at Ashton Gate on Saturday. Regarding talk of interest in Dembele from big clubs in England and Europe, Symons said: "Moussa is a player we will work on to improve. "Talks over a new contract are in progress and we want him to sign. I am very hopeful it will happen." The teenager has now scored four goals in his last two games and eight in 16 appearances in all competitions this season. Symons believes Dembele, who joined from Paris St Germain in 2012, still has a lot to gain from staying at the Championship side long term. "He is at the right club to develop his game because we have some good people to offer him guidance," added the former Wales international. Meanwhile, the Fulham boss was happy with his side's performance at Bristol City. "First half I thought we were excellent and took our goals really well," he said. "We could have put the game to bed in the second half with a couple of early chances, but Bristol City kept going on made it more difficult for us."